Free download Pidgin latest version 2.12.0. 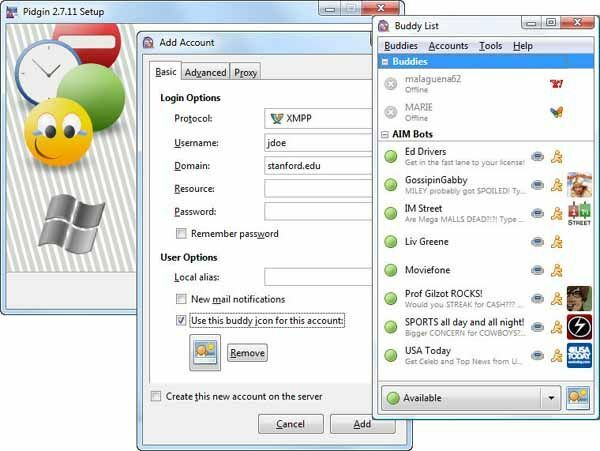 Pidgin is a chat program which lets you log in to accounts on multiple chat networks simultaneously. This means that you can be chatting with friends on MSN, talking to a friend on Google Talk, and sitting in a Yahoo chat room all at the same time. Pidgin runs on Windows, Linux, and other UNIX operating systems. Looking for Pidgin for OS X? Try Adium! Pidgin is compatible with the following chat networks out of the box: AIM, ICQ, Google Talk, Jabber/XMPP, MSN Messenger, Yahoo!, Bonjour, Gadu-Gadu, IRC, Novell GroupWise Messenger, Lotus Sametime, SILC, SIMPLE, MXit, and Zephyr. It can support many more with plugins. Pidgin supports many features of these chat networks, such as file transfers, away messages, buddy icons, custom smilies, and typing notifications. Numerous plugins also extend Pidgin’s functionality above and beyond the standard features. Pidgin integrates with the system tray on Windows, GNOME2, KDE 3, and KDE 4. Pidgin is under constant development. Releases are usually frequent and driven by user contributions, such as bug reports and patches.